I tried different things without success (manual audio mixdown before the QTref export, export with wave audio / export with aiff-c audio, different bit-depth, different sample rates...). I also tried different project framerates (1080i50 or 1080i59,94) to check if there is a bug with QTSource working on PAL-area framerates... I am quite convinced that it has to do something with the Custom avi synth script or the QTsource. 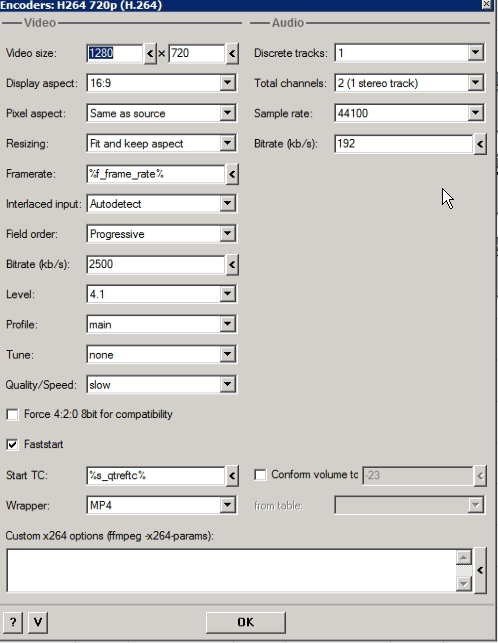 Because here I have still and ooooold Procoder 3 who still can work with QTref files from avid mediacomposer and when I throw in the same QTref in both machines, the Procoder3 creates a file with correct sound and the ffastrans creates a file with the audio glitch at the end of the file. Even if I playback the original qtref in Quicktime Player or import it back into avid mediacomposer, everything is fine with the audio. # Please visit http://avisynth.nl/index.php/QTSource for more info on how to use QTSource. The checkbox with "set as 64 bit AviSynth" is unchecked, because otherwise the encoder fails with an error like "cannot load a 32bit dll in a 64bit avi synth"
I set color = 2 because otherwise encoding was much slower with nothing there or 1 or 0. But 1 and 0 also create the glitch. I tried quality = 100 but it didn´t change anything concerning the audio glitch. Any further advise? I run the ffastrans on a win10pro 64bit machine. I have exactly the same script and it works. Color must be set to "2" to deal with AVID video. Could you please post your versions? So which FFastrans-version (x64 or x86), latest patch applied?, which quicktime version, which avid mc version used for creating the QTref. The source QTref plays/transcodes fine in procoder 3, quicktime player and also if imported back into avid mediacomposer, no glitch in sound. The glitch also occurs if I just throw in a wave or any other file into a workflow that contains the custom avisynth script for enabling qtref / QTsource. So I will have to further investigate tomorrow which *.exe finally caused the glitch but I would say at the moment that the reason for the audio problems has something to do with the windows 10 OS. Well, that is sad but that can besolved, either by someone finding a fix for this behaviour or by me dumping the win10 os and going back to an oldschool win7 OS on this particular transcoding machine. happy to see that you are on the way to solve your sound issue.